This section is dedicated to our very popular Aspire sub ohm tanks and the coils that power them. WHAT IS AN ASPIRE SUB OHM TANK? 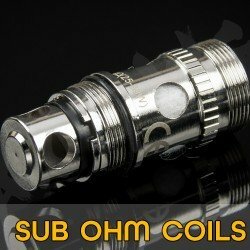 Sub ohm tanks are revolutionary atomisers. They have a resistance of less than one ohm and require powerful mods to safely vape with them. One of the main reasons why they are so popular amongst vapers is that they increase power output – making vaping easy. In addition to this, our sub ohm tanks provide improved airflow, more flavour and huge clouds. The Aspire sub ohm tanks are the most common tanks on the market and are available to purchase at Official Aspire for a competitive wholesale price. Aspire are renowned for their ‘Cleito’ series - a series designed, as part of innovative development, to make it easier for you to fill the tank with e-liquid. Included within this series is the Exo, 120 and Pro sub ohm tanks. The Aspire Cleito is just one of the Aspire sub ohm tanks that we are proud to supply at Official Aspire. The Cleito is designed to suit all vapers and offers controlled airflow. This Aspire sub ohm tank is TPD compliant and is carefully designed to prevent e liquids leaking, whilst offering unrivalled flavour and vapour. Our ground-breaking Aspire Cleito 120 sets the bar high for sub ohm tanks. Creatively designed, it guarantees smooth, controlled airflow and efficient wicking. Due to popular demand, we recently launched the Aspire Cleito Pro tanks. 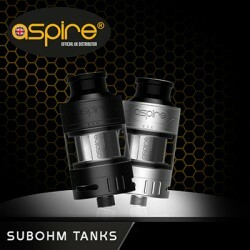 These are Aspire sub ohm tanks – with a difference. The Pro series is carefully manufactured to protect your hardware against heat and cracking which can improve performance. With intense flavours and improved wicking, you can’t beat our Aspire sub ohm tanks. Aspire Cleito EXO Tank ALL COLOURS NOW IN STOCK " The Aspire Cleito EXO tank brings innovation.. Aspire Revvo Tank Introducing the all new Aspire Revvo Tank which combines true innovation and r.. Aspire Cleito Pro Tank - IN STOCK The Cleito Pro was recently launched with the Puxos kit but due.. Aspire Atlantis EVO Tank The amazing stealthy Sub Ohm tank has launched by Aspire. This tank come.. Aspire Cleito 120 Maxi-Watt Tank The Aspire Cleito 120w Tank produces monster clouds and flavour .. Aspire Cleito 120 Pro Tank The Cleito Pro was released many weeks back which introduced the firs..